GAINESVILLE, FL- The Florida Gators softball team has been one of the top fielding teams in the country in each of the last four years. On Thursday night, fielding cost the Gators. Florida fell to Alabama 3-0 in game one of the Super Regional. The game was moving incredibly quickly without a single run scoring. The top of the fifth would prove much different, however. Florida sophomore pitcher Kelly Barnhill began the inning by walking Alabama’s Bailey Hemphill. A poor decision by Barnhill to make the play at second on a sacrifice bunt put two runners on (to be fair, Reagan Dykes was likely going to be safe at first). Tide RF Chandler Dare laid another sacrifice bunt that was fielded by Barnhill. Barnhill chose to throw to first, but overthrew Nicole Dewitt. Both Auburn runners scored on the error. With Dare on second base, Sydney Booker chose to sacrifice. Barnhill again fielded the bunt, but again overthrew Dewitt, scoring Dare. Despite not hitting the ball past the pitcher, the Crimson Tide took a 3-0 lead over Florida. Florida had a chance in the bottom of the fifth. The Gators loaded the bases on Alabama’s star pitcher Alexis Osorio. Catcher Janelle Wheaton flied out to left field ended the threat. Barnhill pitched five innings and only allowed one hit. She struck out 11 Alabama hitters before giving way to Aleshia Ocasio for the final two innings. All three Tide runs were unearned. Florida must find offense on Friday and Saturday. 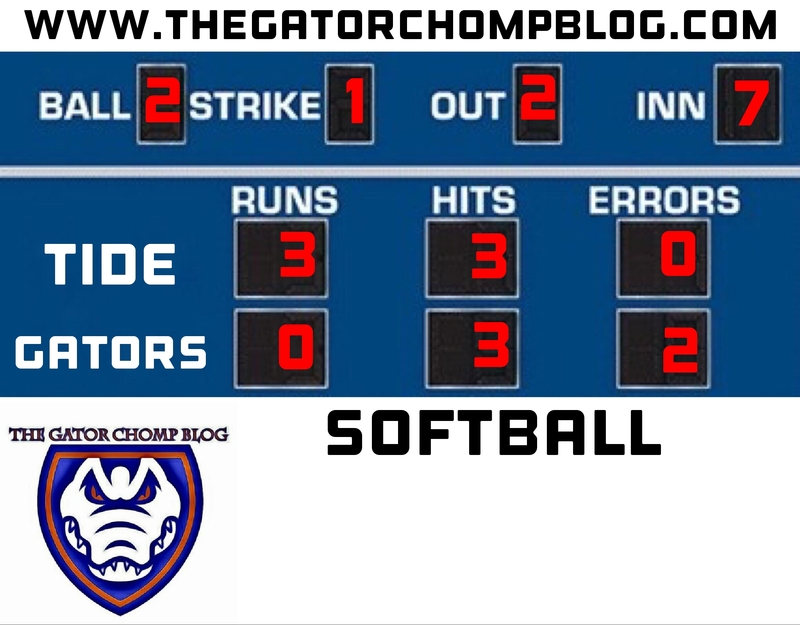 The Gators must win two in a row in order to get to Oklahoma City for the Women’s College World Series.